Why Birth Is A Feminist Issue ? During International Women’s Day we shared the link to a brilliant article writer by Gaye Demanuele. This piece was published in the Freedom Socialist Organiser, the publication of the Australian Section of the Freedom Socialist Party. It is hosted on-line at www.socialism.com. We are now republishing the entire article here on our blog with permission. “Control of our bodies, control of our lives!” This chant has been sung out by women over many years. If self-determination applies to all aspects of women’s lives, childbirth belongs in the full spectrum of reproductive rights. A woman’s choice of how, where and with whom she gives birth is as important as her decision to become pregnant, to end or to continue a pregnancy. The sexist stereotype of the “good mother” as selfless and uncomplaining has fostered a blanket silence about birthing. In the hard fight for abortion rights—now under renewed rightwing attack—the feminist movement of the last five decades has mostly bypassed women’s rights in childbirth. Until recently, feminist discourse has largely ignored them. Today, reproductive rights advocacy groups around the world primarily focus on abortion. But there has also been a rise in childbirth rights organisations. Formed by women, they challenge the technological takeover of childbirth and its questionable science—coining the term “obstetric violence” to expose the extensive harm this has caused. These bodies demand that birth be “humanised” and that women have full autonomy in making decisions throughout their pregnancy and birth. November 25th marks International Day Against Obstetric Violence. Worldwide, childbirth is in crisis. Medical interventions are at record highs, with no concurrent gains in safety for mothers and babies. Many women report feeling abused and disrespected in their experience of maternity care. They feel disempowered by their birth experience. In Australia, suicide is one of the leading causes of maternal deaths in the postnatal year. In the United States, the maternal death rate resulting from caesarian section is increasing; it is higher for women of colour. 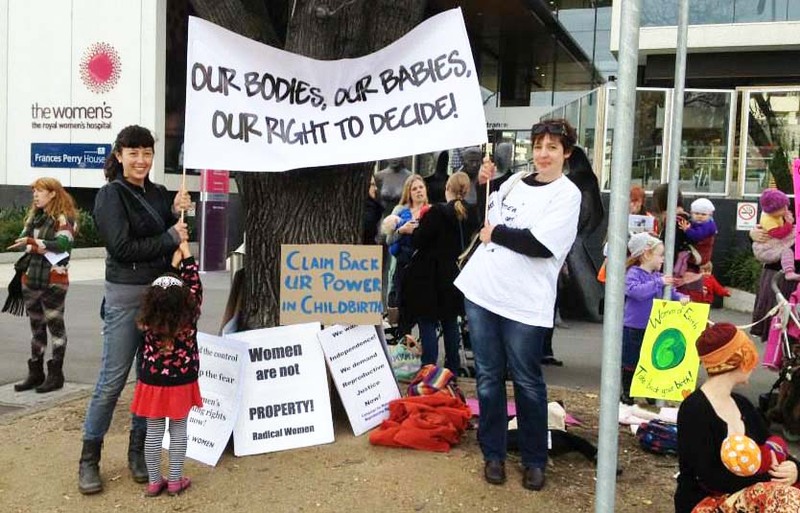 Melbourne’s first birthing rights rally was held outside The Women’s hospital, June 2013. 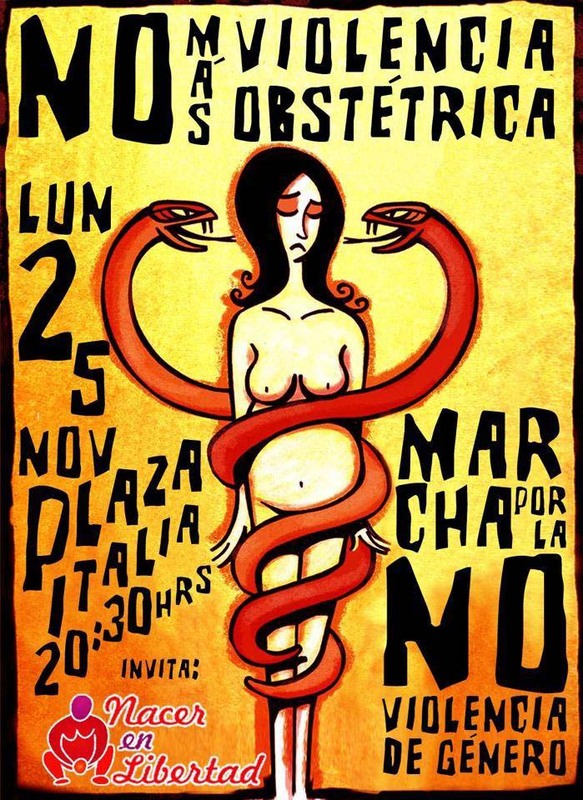 Right: Poster rallying for International Day Against Obstetric Violence. In Australia and the U.S. (with the UK and Europe not far behind), one in three women now have their babies “delivered” by caesarean section—that is, via major abdominal surgery. Fifty percent of women have their labours induced or sped up with synthetic hormones. This disrupts the release of endogenous neuro-endocrine hormones, which primes love and nurturance in mothers and their babies. Women report being coerced through fear-based language to consent to procedures and interventions they do not want. A few are denied the procedure of their choice. Rather than feeling empowered through their experience of giving birth, they are left to cope, or not, with the effects of physical and emotional trauma. Women who speak out are demonised as selfish, as putting their birth experience above their baby’s safety. Who could care more about her baby than the woman herself? Medico-legal complex in control. Obstetric practice is based on risk aversion, dictated by insurance underwriters—not on good evidence of where true need exists. More women are facing legal action, accused of acting against the “rights” of their foetus. Midwives and doctors who support women’s autonomy are similarly persecuted. By putting its trust in technocracy instead of the birthing woman, the maternity care system is failing women. Why is the culture of childbirth saturated in fear? Why not trust women to make their own informed choices about their bodies and their babies? The answer lies in the rise of private property and the division of society into classes many millennia ago. The ruling class needed to exterminate what remained of matrilineal kinship society and subjugate its respected leaders: women. So it invented patriarchy. Today, midwives are sanctioned, fined and, in some countries, imprisoned. Agnes Geréb, a Hungarian midwife and former obstetrician, remains under indefinite house arrest awaiting re-trial, after two years spent in prison for the “crime” of supporting women in their choice to birth at home. Several North American midwives await trial, having been charged under state “foetal personhood” laws. In Australia, UK and Ireland, independent midwives, who have continued to support birthing women whose choices fall outside of “one size fits all” guidelines, are severely penalised. Traditional midwives in “developing” countries are demonised as dirty, ignorant and dangerous. Where women’s choices go against the prescriptive obstetric model, they too are sanctioned, firstly with coercive and shaming tactics. Women who stand up for themselves are reported to child protection authorities or threatened with legal action. In a few cases, they are forced to undergo court-ordered procedures. Alicia Beltran, from Wisconsin in the U.S., was recently arrested and forced to undergo treatment that she did not want or need under that state’s “foetal protection” law. Alice’s “crime” was giving an honest answer to a question during an antenatal health check. She disclosed that she had suffered a past dependence to pain medication, which she is now free of. A lawyer was appointed to represent her foetus, however she was not entitled to a state-appointed lawyer. There is a litany of similar cases across the U.S. The slippery slope is edging closer in Australia, with similar laws being proposed here. Anecdotally, across Australia, there is an increase of reports of birthing women threatened with notification to child protection services for declining unwanted treatment. Take back power. Women’s human rights are violated by a system that treats them as incubators. A system that uses “the best interest of the child” as a weapon; that deems women incapable of making “good choices” in order to police them. It is time that women claim back their power in childbirth. Few groups connect the dots of women’s right to make decisions in pregnancy, childbirth and parenting, the right to safe abortion and the right to direct the course of their lives. Radical Women sees this connection as vital for the feminist movement and its capacity to win equality and justice for all women, mothers or not. After all, at its essence, feminism is about women’s liberation—and setting everyone free. *The terms “woman,” “women,” “mother” and related pronouns have been used throughout this article. The writer respectfully makes recognition that some people who give birth may identify with another gender term. This entry was posted in Feminism, VAW, SRHR, Pro-Choice Discussions and tagged abortion, Reproductive Rights, SRHR. Bookmark the permalink.